We will set up a joint. And with “set up” we really mean “set up”. Our joint will be 10 meters in height. Where? Joanneum, Graz (as part of “Absolutely Free”). Funny how a 1,39 million km large ball of fire can make such a difference. 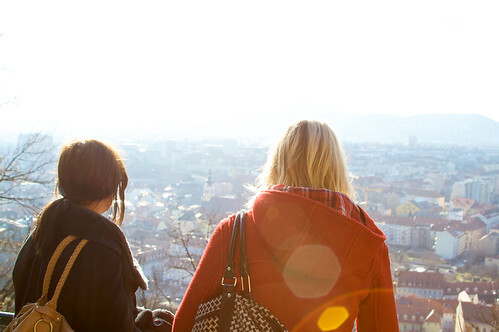 Graz is nicer in summer. Everybody knows that, especially the ice-cream vendors and Megaphone salespeople. There is a certain flair in the city around christmas, but the rest of the winter is pretty much cold and wet. However, there are these rare sunny days, with no fog, no rain and, if you are very lucky, no work to do! The sun is warming up the city from over 150 million kilometers away. These are the days you should put on a warm jacket and get out to try AND catch some of those warming rays. Get some fresh, cold air, reload your batteries! Last friday, I joinded the Critical Mass Graz. It was by far not as critical as I expected, but I was told there were normally more cycling enthusiasts joining the monthly ride. There was a demonstration scheduled for the same time, and the not soo nice weather probably did the rest. Peoples reactions are mostly big smiles, but also (especially car drivers) occasionally call you a stupid jerk. Critical Mass is a bicycling event typically held on the last Friday of every month in over 300 cities around the world. While the ride was originally founded with the idea of drawing attention to how unfriendly the city was to bicyclists, the leaderless structure of Critical Mass makes it impossible to assign it any one specific goal. In fact, the purpose of Critical Mass is not formalized beyond the direct action of meeting at a set location and time and traveling as a group through city or town streets. The next Critical Mass in Graz will be on the last Friday of October, wich is the 31st! The Fourelements festival is back, with the 4 ingretients: Rap, DJing, Graffiti and Breakdance, presented on 7 spots in Graz. I was at a live performance of MC Klumzy Tung, DJ Dero and drummer Dr.Pheel yesterday at the Parkhouse and I loved it. 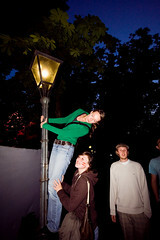 Their first CD will be presented on September 19th at the Postgarage, Graz. You better be there! Check foruelements.at for a timetable of the upcoming events. There have beens several massive thunderstorms during the last week. Graz has been the city with the most rain/m^2 and the most lightning in styria. 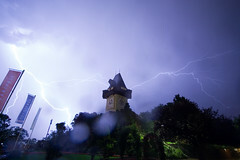 Several thousand flashes hit Graz and the surrounding area during the last few nights. Yesterday was Austria’s chance to beat the Germans in soccer. Unfortunately they didn’t make it, although they did play a great game. As expected, the two public viewing areas in Graz were crowded. What I didn’t expect was, that they wouldn’t let people in anymore, more than an hour before the game started. 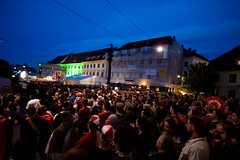 Since the Public viewing areas in Graz are commercial events, organized by newspapers and sponsors, they have blinds on the fences, which make it nearly impossible to view the game from the outside. A few stood on trashcans and some even climed onto trees to get a clear view. The mood was great however. Too great to go watch the game at home with some friends, so I joined some hundred people, Austrians as well as Germans, sitting in front of a single TV, not far from the videowall we couldn’t see, but close enought to hear the outcry of thousands of people, when Michael Ballack shot the goal. 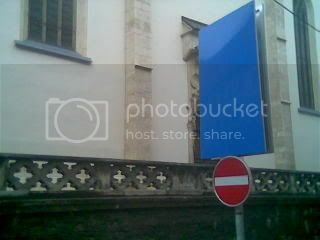 After a little over 90 minutes, the game ended, with lots of disappointed austrians heading into the city or back home. 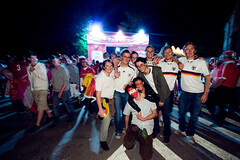 On the other hand, there were also some laughing germans, that celebrated the victory of their team. We’re not the best in soccer, true, but after all, people seem to get in the mood for the UEFA Euro 2008. Especially after yesterday’s result. I guess everybody is looking forward to the match Austria vs. Germany! A little delayed, but still worth mentioning, a few impressions of the Synthesizerpark Presentation during the SpringEight Festival. Countless Synthesizers from all decades, open for everyone to play. Loud and Fun!